Apple’s iTunes 11 is a complete makeover to Apple’s media hub, simplifying the interface, adding more iCloud integration, and adding a new MiniPlayer. The design is intuitive and visually pleasing. Though it has made a major update in some respects, it didn’t change the transfer function. Now, the Apple TV 3 is powerful enough to decode Full HD 1080p movies. For booming audio effect, the crisp and vivid 1080p image should pair with 5.1 surround sound. The 6 channels audio gives Apple TV 3 better sound that you’d ever expect, so you can enjoy clearer dialogue, consistent volume levels, and superior audio. In view of this, you may plan to stream your favourite Blu-ray/DVD full HD movies to Apple TV 3 via iTunes 11. But, iTunes 11 can’t recognize Blu-ray DVDs. Meanwhile, Apple TV 3 itself can not play 5.1 audio directly, it needs the receiver in your surround system to decode the 5.1 audio into six channels and distribute them to six speakers. So really, the Apple TV 3 doesn’t need to decode 5.1 audio, it only needs to hand the surround audio stream to a receiver than can decode those formats. Below, i will show you how to convert Blu-ray/DVD movies to iTunes 11 for streaming to Apple TV 3 with AC3 5.1 surround sound. First of all, download and install the Blu-ray/DVD to Apple TV 3 Converter on your computer. If you are Mac user, you need to use the Mac Blu-ray/DVD to Apple TV 3 Converter. 1. Run the best Blu-ray/DVD to ATV 3 Converter. Once its main interface pops up, click “Load file” button to import your source media. 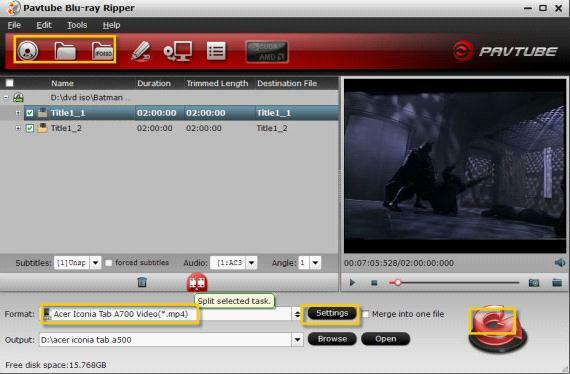 When the movie files are loaded, simply tick off the checkbox before the movie title you want to convert for watching with Apple TV 3 Gen.
Pavtube Blu-ray Ripper has a number of presets for Apple TV, Apple TV 2, and Apple TV 3rd Generation. 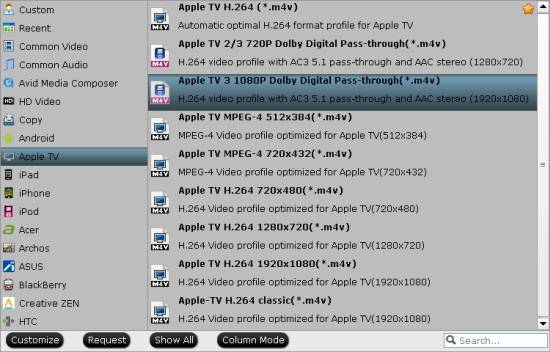 To export Apple TV 3 1080p video with ac3 5.1 passthrough for AV receiver decoding from Blu-ray sources, “Apple TV 3 Dolby Digital Pass-through (*.m4v)” preset is highly recommended. You can also select “Apple TV 2/3 720P Dolby Digital Pass-through (*.m4v)” as target format to create 720p video with AC-3 5.1 surround sound if your source media is DVD video. No matter you choose “Apple TV 3 Dolby Digital Pass-through (*.m4v)” or “Apple TV 2/3 720p Dolby Digital Pass-through (*.m4v)” as output, an AC-3 encoded audio track will also be included for Apple TV 3 to Pass-through Dolby Digital 5.1 sound (also know as AC3 5.1), so that it will work in surround sound when Apple TV 3 is connected to audio receiver, and in stereo when Apple TV Gen 3 is connected with TV only. By the way, if you wanna encode a Blu-ray DVD movie for a quality playback on both the Apple TV 3 and Apple iPad 3, the “Apple TV 3 Dolby Digital Pass-through (*.m4v)”preset is also a recommended choice. Click “Convert” button to transcode Blu-ray/DVD movies to iTunes 11 for streaming to Apple TV 3 with AC3 5.1 surround sound. When the converting task is done, you will get a 1080p/720p M4V video for ATV 3 with Dolby Digital 5.1 surround sound pass-through by clicking “Open” button.